A Snowy Owl 'in the middle of nowhere' was probably our most exciting find. SPRING BIRD MIGRATION CONTINUES WELL INTO JUNE IN ICELAND and it is probably the best month for rarities there. High Arctic breeding birds still on their way north occur alongside overshoots and long-stayers. I managed a total of 84 species during my stay in Iceland earlier this month, on back-to-back Wild Images and Birdquest tours including a good number of rare migrants and actually equalled the Birdquest Iceland life list total prior to 2017! I might even make it into treble figures one day at this rate. However, it is worth remembering that the top Icelandic listers are over 300, with totals consisting mostly of vagrants! 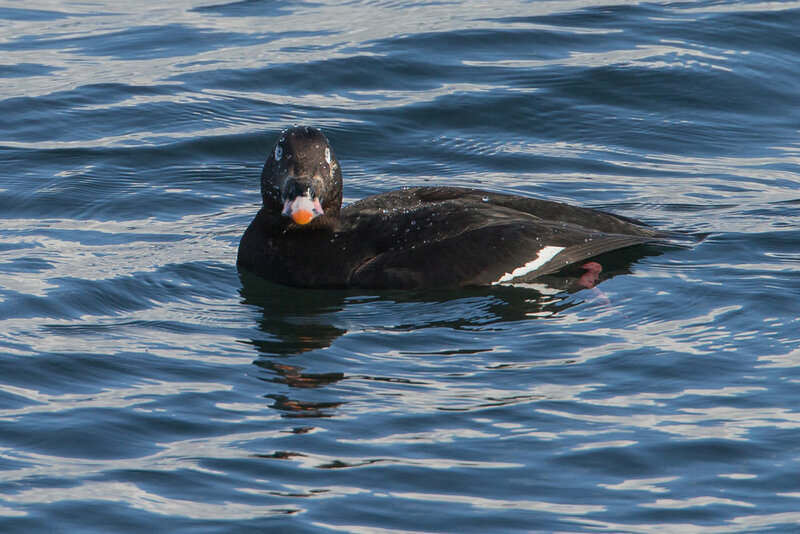 Just off the flight from Manchester (on which, by chance, I was sitting in the next row to Reykjavik birder Edward Rickson) virtually the first bird I saw was the super-smart drake White-winged Scoter at Sandgerdi. A WP lifer for me and a great welcome back to Iceland! It has been hanging around the Reykjanes Peninsula for the last few years but there is a lot of foreshore along which to search for it and it can go missing for days. Having been around so long now, the local birders hardly keep tabs on it. Very soon afterwards I caught up with Iceland's first Black-winged Stilt just south of Sandgerdi, which had been around for a couple of weeks and had understandably caused quite a stir when it first arrived. Next stop North America? Although technically it was already standing on the North American plate here. It paced around a shallow pool surrounded by eiders and Arctic Terns. Sandgerdi is a true WP rarity hotspot and in the space of a few weeks this year this area also hosted Bonaparte's, Sabines and Little Gulls, Lesser Yellowlegs, Black-crowned Night Heron and Bufflehead! Iceland's first Black-winged Stilt, Sandgerdi. Other notable sightings on my travels included King Eider (two adult drakes), American Wigeon, Mandarin (certain Belgian-ringed escapes at Húsavík but another on Flatey of uncertain origin), Black Tern, a couple of Little Gulls, Common Crane, Long-tailed Skua (four, including one on territory hundreds of km from the single known breeding area), a pair of Bramblings and best of all, a magnificent Snowy Owl, also away from any known breeding areas 'in the middle of nowhere'. We looked for the owl again about a week later and despite some hours spent searching were unable to refind it. However, with so much wilderness it is easy to find your own birds in Iceland and were it not for the eye-watering cost of food and accommodation more birders would surely explore this fabulous country. Finally thanks to my birding friends in Iceland: Gaukur Hjartason, Yann Kolbeinsson and Edward Rickson without whose help I would certainly have seen a lot fewer birds! Brambling, the female of Iceland's only breeding pair. SNOWY OWL WAS THE LAST BIRD I EXPECTED TO SEE IN FLORIDA as I booked my flights for the 17th Annual Space Coast Birding Festival last autumn. I had toyed with the idea of having a stopover in the northeast in the hope of catching up with the amazing Snowy Owl influx to the USA but had been talked out of it by Pete when we looked at the chance of heavy snowfall there causing travel delays. I was lucky to avoid a foot of of snow in New York yesterday, the airports were closed and 3000 flights were cancelled across the northeast USA... but the influx had already kindly delivered one of these magnificent owls to Florida instead. There are only two previous records for Florida, which is not surprising considering that Little Talbot Island lies at the same latitude as Agadir in Morocco on our side of the Atlantic! Another irony is that it is not purely the blast of polar air that has affected much of North America this winter that is responsible for the influx but more a bumper lemming year on the owls' Arctic breeding grounds. This morning's encounter was a very special one without another birder in sight on the lonely beach here, the sky completely clear blue in an icy northwest wind. The current cold winter is also affecting Florida, with the temperature in Jacksonville just above freezing at 38 degrees fahrenheit but the wind chill made it feel much colder. There were a few other birds around and these included: Western Osprey (two); Northern Harrier (four males); Brown Pelican (three) and Northern Gannet (many feeding offshore). A small group of 5 bottle-nosed dolphins swam north and the more sheltered parts of the dunes were full of Yellow-rumped Warblers and Savannah Sparrows. A Palm Warbler, a couple of Northern Cardinals and several Northern Mockingbirds were also here. I usually listen to the radio to relieve the boredom of road journeys in the states and there is always some interesting comment. Today's outstanding contributions were the 16(!) signature sauces for you to try at Buffalo Wild Wings and news reader Renée Montana who reported 130 people killed so far in the crisis in Syria (the present total is estimated to be more than 120,000) - can we believe any of the nonsense on the news here?